These two fundamental functions have been pivotal to the evolution of every culture. The advent of computers in the 50&apos;s brought about a major transformation in the speed with which massive amounts of data could be analysed. The marriage of information with technology was a natural progression in this evolution. Since this event, information technology has been transforming our knowledge base at an unprecedented rate. It is almost impossible not to come in contact with information technology in our day to day life, e.g. banking, credit cards, air travel etc. What started as a need to protect strategic data being destroyed in case of war has progressed into a powerful platform for permanent peace on this planet. This was the beginning of Internet. The American vision of Super Highways and the desire to share information with the rest of the world resulted in the “net” being opened to anyone who chooses to join in. When you connect into the Internet you have the potential to communicate with every other individual on the net. 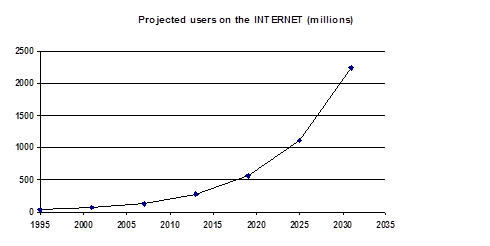 There are approximately 30-50 million users on the net. Who are the users on the “net”? Who owns the net and who controls it? • No one owns the net and no one controls it. Although commercial advertising to all groups on the net is against the Netiquette there is nothing against commercial transactions being carried out through the net. It is almost certain that a proportion of buying and selling in the future will be structured through the Internet. e.g. Buying Software to flowers. Exchange of information at a rate of 300 Mbps. Real time videos, animation and graphics. Virtual reality will become the next biggest agent of change on the Internet. With virtual reality one could test drive a car, provide clinical consultation or even perform surgery. • In-tune with computer and the Internet. • Make decisions on the strength of information. • Demand the best service and will be “destructive“ in expressing dissatisfaction. There would be a natural tendency to move into the insurance business which would be linked to lifestyle. • Those who are ready to tune in to this technology. • Those who have had experience with accumulation, organisation and conversion of data into useful information. • Those who have the vision and ideas to take a lead in connecting to the future. • Software companies who have acquired expertise in this field. • PR and Ad agencies who have the expertise and experience in this field. Scientific Reason as to why the commercial world is set to take this direction? Avogadro&apos;s Law: A generalised Principle. Under the same conditions of temperature and pressure, equal number of molecules of all gases will occupy the same amount of space. This is cosmic democracy in the physical world. All humans on this planet irrespective of their status, nationality, colour or religion are equal in one respect - the freedom to think, which can be described as democracy in the metaphysical world. The Internet will create an environment which will allow citizens of the world to acquire any knowledge about themselves and the universe around them, to express opinions, have the freedom to think and act at global level, in a global sense and global terms. Any attempts to control the freedom of the individuals are doomed for failure. Perhaps this would explain why Communism as an “experiment” failed in Russia and why the Berlin Wall had to come down. The Internet is not simply a protocol but the foundation on which the future generations will construct the new global structures, exchange ideas, conduct business and shape the destiny of the unified world. Companys choosing not to participate on the Internet would be committing a suicide.